WFT is a leader in the nanostructure and microstructure industry due to our vast experience with so many structures. We have over 20 year experience working with microstructures as well as over 10 years producing rolls of microstructure product. There are few companies in the world with the experience and ability to originate, tool up, and produce the type of products that WFT is capable of producing. WFT is fully integrated now with the ability to design and originate your custom Diamond Turned Structure, reproduce the microstructure product in a roll to roll process, metallize it if necessary and finish it, completely in-house. WFT’s new state of the art Diamond Turning Facility is a premier ultra precision machining lab. Many types of Molds can be produced in this lab. These Molds are then turned into embossing tools used on a UV casting machine to replicate the structure onto a film substrate such as PET film. The types of cuts that can be made for tool/mold fabrication include: Cylindrical Drum tools, Flat faced mold tools, and Fly-cut tools for exotic and deep aspect ratio structures. The types of Molds that can be cut include: Grooves (prism and truncated prism structures), Contoured Grooves that have a new angle on each cut and Valley. Structures can be cut with rounded tip radii or virtually dead sharp tips. 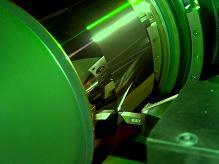 WFT currently produces film rolls of Prismatic, Lenticular, and Fresnel lens microstructures. Our tooling technology allows us to step and repeat a microstructure to combine it into a larger area if necessary for production. We can even combine different structures into one origination to create Hybrid structures.